A San Francisco woman who was celebrating her first wedding anniversary in Mexico City died when she was hit by a bullet meant for someone else. Now, her heartbroken husband is sharing exclusive details with ABC7 about his wife. 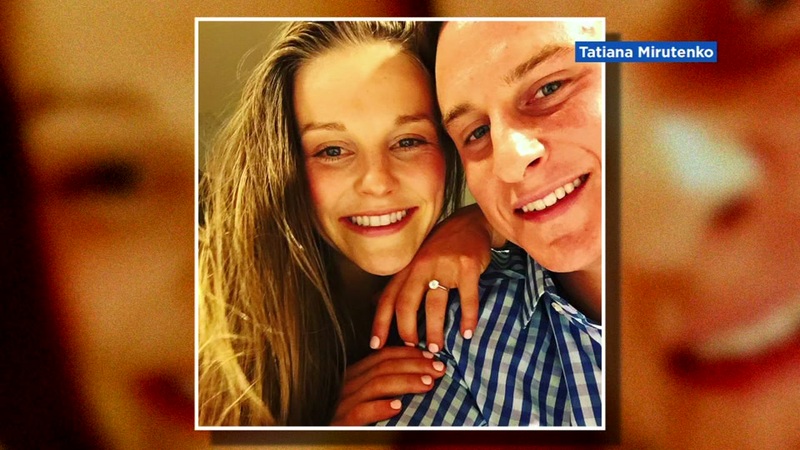 MEXICO CITY (KGO) -- A San Francisco woman who was celebrating her first wedding anniversary in Mexico City died when she was hit by a bullet meant for someone else. Now, her heartbroken husband is sharing exclusive details about his wife through an email with ABC7 News. Scroll to the bottom of this page for his full statement. 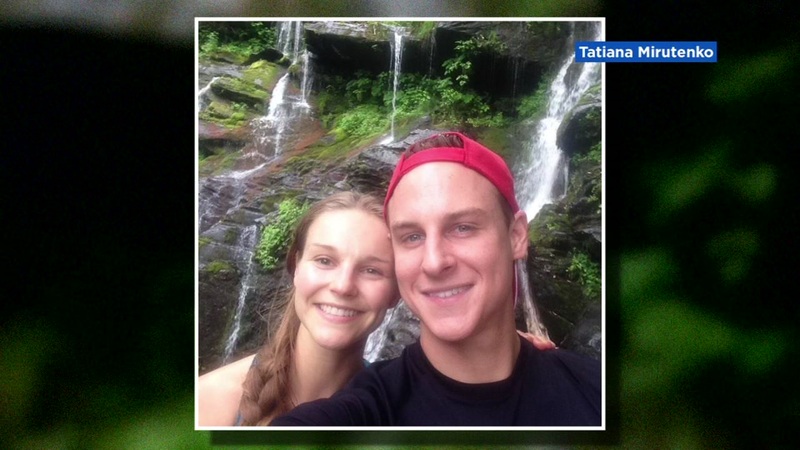 James Hoover told ABC7 wants 27-year-old Tatiana Mirutenko to be remembered as a woman who lived life to the fullest, right up to her final moment. "When a person of Tatiana's bravado is taken so suddenly, the void that is left is numbing," he said. "She will be missed dearly by many. She had an incredible amount of life left in her. I loved her so much." Hoover says the two were leaving a restaurant Saturday night when Mirutenko was hit by a bullet meant for a bouncer a few feet away. He tells ABC7, "Her death was instant. She did not suffer. The incident was all so sudden and surreal." 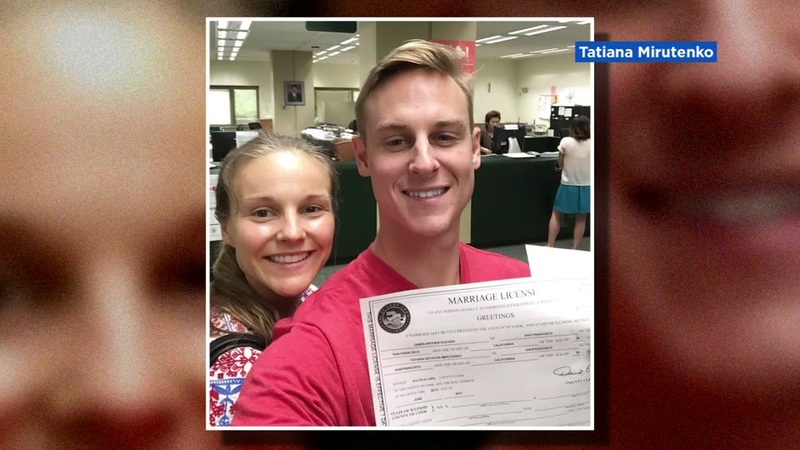 It was surreal because the San Francisco couple had been having the time of their life in Mexico City, celebrating one year since they got their marriage license in Chicago, her hometown. They were there after the U.S. issued travel warnings, but Hoover tells us they felt perfectly safe. The trip was the latest chapter in their tale of adventure and romance. Hoover writes, "We loved to travel, and we spent our best times together skiing, hiking, surfing, exercising and eating." Their social posts are a testament to their wanderlust. They show them skiing in Colorado where he proposed, soaking up the warm sun in San Diego and hiking beautiful trails in the Pacific Northwest. They were partners in exploration. Her mother, Natalie Mirutenko, spoke with ABC7 from Chicago this past weekend. "She would give 200 percent," said Natalie. "As a mother, we always say things, but she inspired me to be better. I'd give my life if she could just come back." Mirutenko is missed by her coworkers at Nektar Therapeutics, where she's worked since 2016. In fact, that job is why she and James moved to the Bay Area. Hoover has no comment for the gunman, who's still on the loose. But he calls Mexico City "beautiful and lively" and its people "hospitable and gracious." James Hoover's email responses about his late wife to ABC7 News are below. How would you describe Tatiana to someone who had never met her? Tatiana was a passionate, loving, smart, beautiful woman. She was an athlete, a foodie, a wino, a Netflix binge-watcher, a hiker, a skier, an investor...the list goes on. She had so many interests. Her curiosity was one of her best qualities. Food was definitely an important part of her life. She loved to eat tasty, healthy meals no matter if we were dining out or in. I have so many great memories of us preparing meals together. She lived life to the fullest. She attacked every opportunity that life gave her to grow and develop herself personally and professionally. She inspired me seek out ways to make myself a better person. She was the best friend and partner anyone could ask for. I miss her so much. We met in Chicago in January 2014. I was living in the city after graduating from college. My brother and his college roommate were visiting me one weekend, and we attended a reunion for my brother's roommate's summer camp friends that included Tatiana. When I saw "T" at the party, I couldn't take my eyes off of her. My brother helped to break the the ice between us. Once he introduced us, her vibrant personality and warm smile captured me for good. I referred to her as the "angel girl" to my friends over the next couple of weeks until I asked her out on our first date, which was on Valentine's Day. Our love began the first moment we met in Chicago. Everything clicked. We were ambitious professionals who were driven in our careers. We deeply respected one another. We loved to travel, and we spent our best times together skiing, hiking, surfing, exercising, and eating. I got to know and fell in love with her parents, her sister, and her friends in Chicago. We vacationed with each others families to Huatulco, MEX and Aspen, CO. I proposed to her in October 2015 during a weekend trip to her alma mater, Clemson University, for Homecoming. We celebrated there with friends, and returned back to Chicago to celebrate with our families. I couldn't believe how I got so lucky to marry her. We had an amazing wedding in Chicago last July with over 200 of our closest friends and family. We were so fortunate for the love and support that we received from our friends and family in our marriage. I loved her so, so much. Her family. She was so close with her parents and her sister, which is something that I really valued about her. We shared this value for family, which was a key part of our relationship. Her employer describes her as an incredibly positive and hard-working person. What do you think motivated her? Tatiana wanted the best out of life. She wanted to be able to travel where she wanted to, eat where she wanted to, wear whatever clothes she wanted to, drive whatever car she wanted to, and enjoy all of the great things that life offers. She had such high hopes and expectations for herself and for me. She was an inspiration to me in this way. Tatiana transitioned out of a healthcare consulting job in Chicago and was eager for a new adventure in San Francisco. We were thrilled when Nektar offered her the opportunity to join their team in March of 2016. Her experience working at Nektar was amazing. She felt so fortunate to be a part of the Nektar family as well as the San Francisco community. I transferred to San Francisco with my current employer from Chicago after spending some time working on projects in Washington, DC. What are some of the things you liked to do in the Bay Area? We loved hiking and exploring all of the beauty surrounding the Bay Area. I have great memories of weekend trips to Healdsburg, Ukiah, Carmel, and Tahoe. We enjoyed spending time with our community of friends in Mission Bay and around the city. T joined a volleyball league, and I joined a soccer league. We liked exploring new parts of the city after we first moved. Climbing the hidden steps up to Coit Tower, biking through Golden Gate Park, walking to the farmer's market at the Ferry Building on Saturdays, cooking meals together and working out together at our gym in Potrero Hill are some of my fondest memories. In January we adopted a dog, Chai, who T loved so much. We would take him for walks in Fort Funston, Marin and Half Moon Bay. T appreciated her friends in SF so much. Everyone we met during our 2+ years here has been an inspiration to us. It is a special community. What happened the night Tatiana was shot? She was shot as we were exiting the restaurant. She had just left through the door of the restaurant behind another couple that we were with when the shooting began. I was just behind her, still inside, two or three feet from the door, and the shooters' target was a few steps behind me. Her death was instant. She did not suffer. There is nothing, no prior incident, that could have caused this. It was just so tragic and surreal. The security of tourists always seems to be a topic of discussion when it comes to Mexico. Did you all ever feel in danger before the shooting? Never. We felt safe at all times. A few days into our trip, T and I even started discussing how we might be able spend more time in Mexico City because it was so beautiful, comfortable and lively. We were pleased with how hospitable and gracious the people were at the shops, restaurants and sites that we visited.